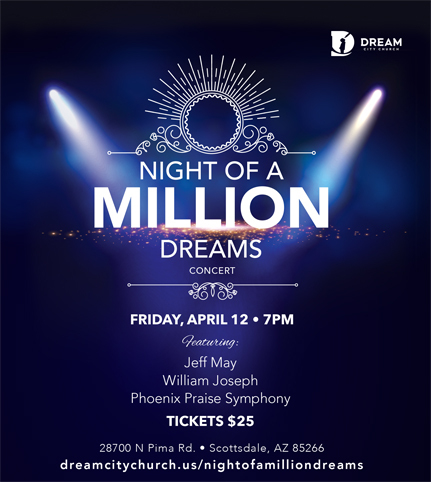 Don’t miss out on an unforgettable concert experience featuring a 34-piece orchestra with vocalist Jeff May, world-renowned pianist William Joseph, and the Phoenix Praise Symphony. Reserved seating is available online for $25 at https://dreamcitychurch.brushfire.com/night-of-a-million-dreams. This concert will be held at the Dream City Church Scottsdale location at 28700 N. Pima, Scottsdale, AZ 85266, on Friday, April 12, at 7 pm. Seating is limited, so buy your tickets today!